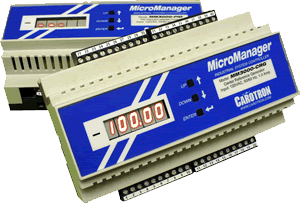 The MicroManager 3000 series is a microprocessor based system (PID) controller designed to handle a wide range of industrial applications. The simple user interface allows high level microprocessor control of an application but without the need of a computer for configuration. The Modbus RS485 communications port allows for all parameters to be read and for selected parameters to be changed. Limited programming capability is also available. Model MM3000-CRG Center Reference Generator is designed for velocity mode winding applications and for torque mode winding/unwinding applications. In the velocity mode, the winder sets/controls the line speed. This is typically accomplished by using a potentiometer input to the MicroManager to set the desired line speed. The MicroManager calculates the required center driven take-up speed to maintain the desired line speed. The MM3000-CRG can also be used on torque mode winders and unwinders (brake and driven). The CRG unit is ideal for use on applications that require more precise torque control than torque taper schemes, but less than full-featured CTCW (constant tension center wind) control methods (such as Carotron’s Cortex LT ®). Operational Modes For winders, the MicroManager can operate with a drive in either the velocity or torque mode. For unwinders, the MicroManager can operate with a brake or drive in the torque mode. The MicroManager provides four methods for obtaining the roll diameter.